Years before AB 51 passed, the CHP released the original Lane Splitting General Guidelines, thanks to years of behind the scenes discussion and research, triggered by talk of banning splitting in California. 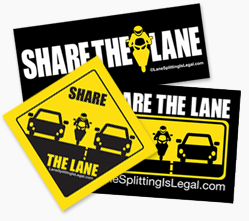 These guidelines were taken down due to a single citizen complaint to the Office of Administrative Law, and after AB 51 passed, new guidelines, known as the Lane Splitting Safety Tips, were issued by the CHP. Lane splitting in a safe and prudent manner is not illegal in the state of California.